The 40th Precinct includes three South Bronx neighborhoods: Mott Haven, Port Morris, and Melrose. The squad will move out of its current location, a 1922 three-story Renaissance Revival station house, and into a new home on a city-owned lot bounded by East 149th Street, Saint Ann’s, Westchester, and Brook avenues. The community space in the station has a perforated facade that signals openness and accessibility. The Department of Design and Construction’s (DDC) set strict standards for police station design that provided the parameters. “Where the station houses of the early 1900s reflect an architectural language of fortification and stronghold, the design of the later 20th century clearly aims to express a sense of civic engagement,” explained Ingels. 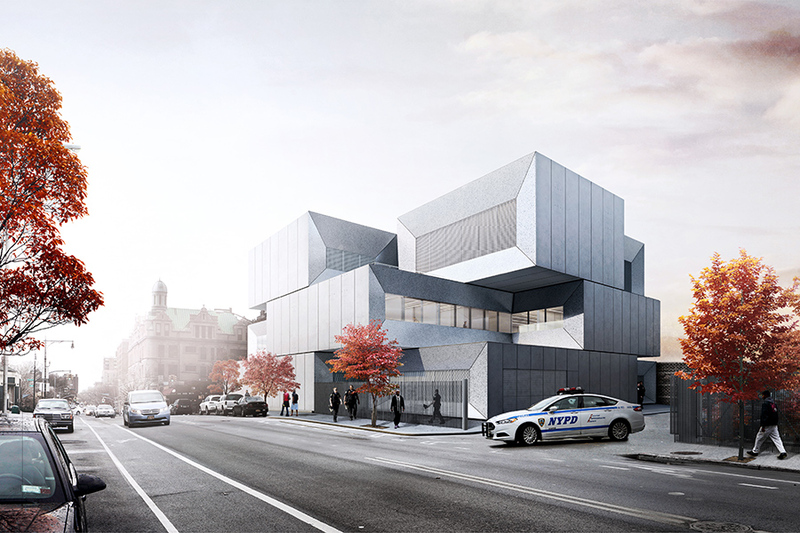 “Independent of era, all precinct designs reflect a sense of solidity and durability, and we tried to evoke this same robustness in the 40th.” Formally, this resulted in stacked boxes, or “bricks,” that reference New York’s classic redbrick police stations, and each programmatic element is meted out into its own rectangular space. There are four different-sized rectangular volumes per floor (except for the basement level) stacked irregularly with gaps in-between to create circulation spaces. According to Ingels, the team spent much of the schematic design phase working out the relationship between these volumes: “The building is essentially a physical manifestation of programmatic relationships.” Segregation of function is intrinsic to the plan, but potentially detrimental to the overall harmony of the building. 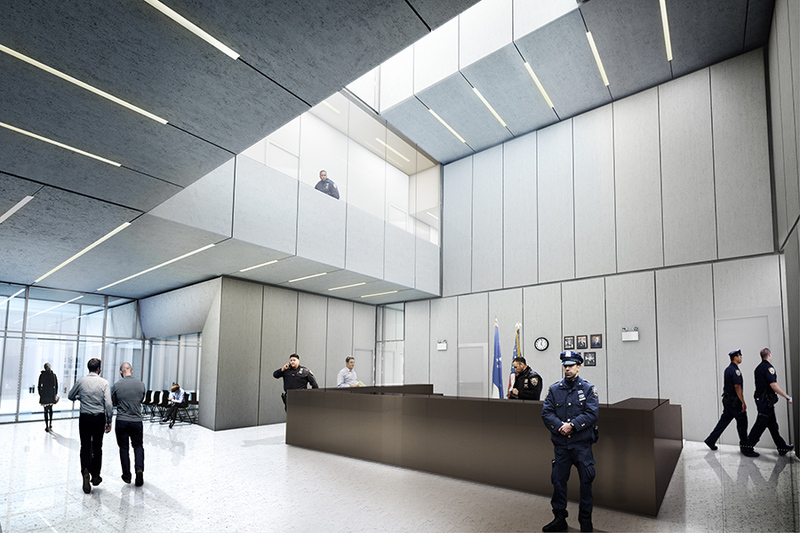 A three-story atrium is a central organizing principle that diffuses this compartmentalization by visually connecting programs, allowing total surveillance from the main desk, and channeling light into the building’s core. The station house entrance on St. Ann’s Avenue. In keeping with the NYPD’s philosophy of community policing, the public entrance beckons from the street, fostering connectivity between the precinct and the people it serves. For security purposes, “glazing occurs only when the volumes are pushed back from the perimeter facades, affording protected views of the street below.” At street level, setbacks created by the layered volumes make entrances and exits legible. On the upper floors, the setbacks allow for large windows, removed from the street. The building is sensitive to its context and the awkward site provided additional design constraints. Flush with St. Ann’s Avenue to the east, an abandoned, below-grade freight line swoops in from the north to bisect the parcel, turning what should be a roughly rectangular site into a right triangle fused to a hexagon. The station house sits within the hexagon, at the corner of St. Ann’s Avenue and East 149th Street, while the rest of the site is devoted to parking. Streetscaping around the lot’s perimeter will further integrate the site into the community. A sawtooth oak at the site’s southeastern corner, for example, will be the basis for a street planting scheme of the same trees. Two existing cottonwoods will provide ample shade for the larger lot. New York–based Starr Whitehouse Landscape Architects led the site design. The DDC, New York City’s primary capital construction project manager, often commissions high-profile firms for civic projects. The department chose to implement a modified version of BIG’s 2014 stormwater protection plan for Manhattan as the East Side Coastal Resiliency Project (which Starr Whitehouse also collaborated on). 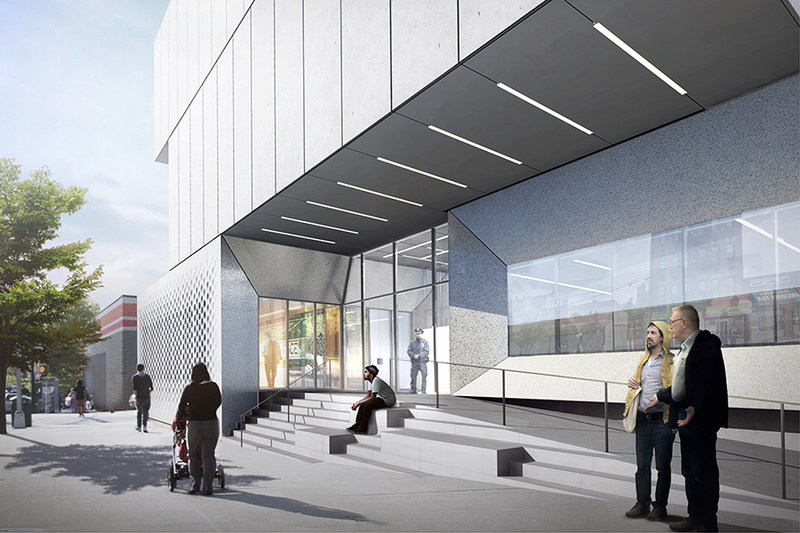 It tapped Steven Holl Architects to design a library in Hunter’s Point, Queens, that broke ground last May, while Snøhetta was commissioned for the recently completed construction of new public spaces in Times Square. 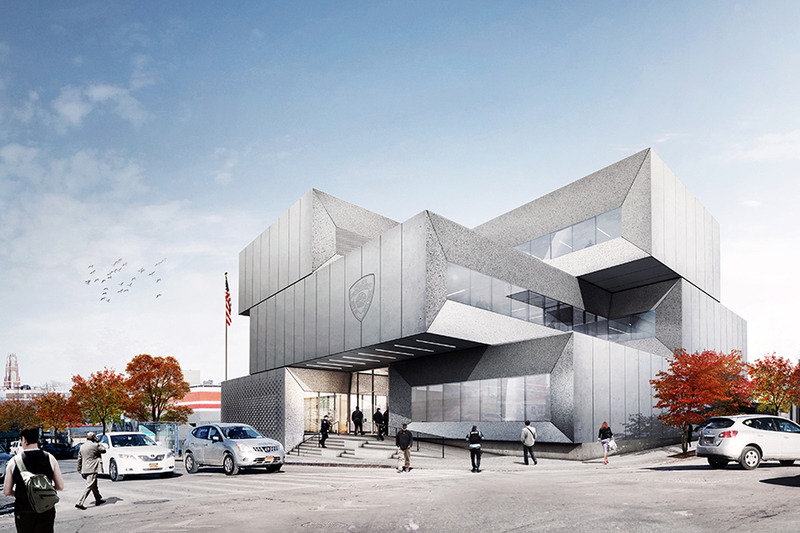 The DDC also picked Dattner Architects and WXY to design the Department of Sanitation garage and adjacent crystal-shaped salt storage shed that opened late last year.